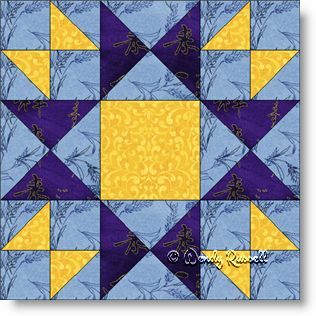 The Evening Star quilt block shows how one block can be taken to a new level by changing things up. This block is based on the Ohio Star quilt block with the addition of additional half square triangles/square patches in the corners, rather than a single square. This quilt block is shown using only 3 fabrics but you can easily use your imagination to change it up by adding additional colour choices. Once again, how you set out the quilt blocks to make up the final quilt has a bearing on the different looks you can create. Colour choices in the final steps of making the quilt can make a huge difference as well.